Congratulations to the Vermont Captive Insurance Association (VCIA) on its 28th Annual Conference. It was great to see the more than 1100 attendees, 100 exhibiting companies, and 60 expert panelists that convened in Burlington. 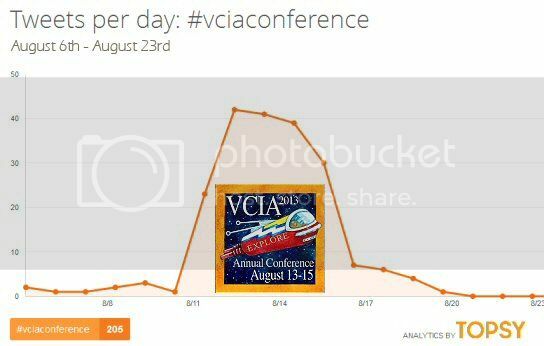 Looking at the Twittersphere, the activity of the #vciaconference hashtag was subdued when placed within the context of Twitter's 58 million average tweets per day; but certainly, it was an increase over VCIA 2012. If you're not on Twitter, please check out CNBC's excellent documentary #TwitterRevolution. Here is a chart illustrating the bump in twitter traffic surrounding the conference. During my 3 days of listening to panelists and chatting with captive owners and service providers, I overheard investment objectives consistent with those of our clients. The overarching need for most captive insurance companies is an investment strategy that provides sufficient cash flow to pay claims when needed and protects the value of the captive. In the session entitled “Avoiding a Black Hole in Your Bond Portfolio,” David G. Schwartz of YKK Insurance Company of America very clearly summarized the investment objectives of YKK's captive program. Now to the tweets. Two are mine and one is from AM Best. While the latter does not pertain directly to investment portfolios of captive insurance companies, I found Jason Flaxbeard's comments about how hedge funds are using captives, rent-a-captives, and segregated cell captives as non-correlated investments to be quite fascinating.